„Give me this player and I’ll give you that one. It’s a no-brainer for both of us as you need rebounds and I need threes”. Well, turns out that it almost always requires some deeper analysis. But the truth is that most of us don’t have enough time to sit with a spreadsheet and look at all the details. In many cases – I was quickly checking if the overall player values more or less match and then accepted the deal. And sometimes quickly afterwards started to regret. Rotisserie in competitive leagues is far more sophisticated than just swapping values in two (or even more) categories. And usually it’s really hard to see full league landscape reflecting the deal effects. In advance. Since we started playing roto available tools developed a bit, but we still couldn’t find anything bringing pictures bigger than just player’s value. The only way to have it was to build them for ourselves. And now it’s time to introduce them to you as well. FB-Ninja Fantasy Basketball Trade Analyzer, the hero of this article, lets managers evaluate deals in many areas, using many sets of sample data and many scenarios. It’s all within your reach and your preferences. Could be simple and basic if this is what you expect it to be. Could be much more informative and detailed if being simple is not enough for you. – last but, well, not least – list of players you want to give up and receive in return. Don’t worry if there are many of them. Just use these cool autocomplete fields and you’ll be surprised how quickly the lists will get ready. 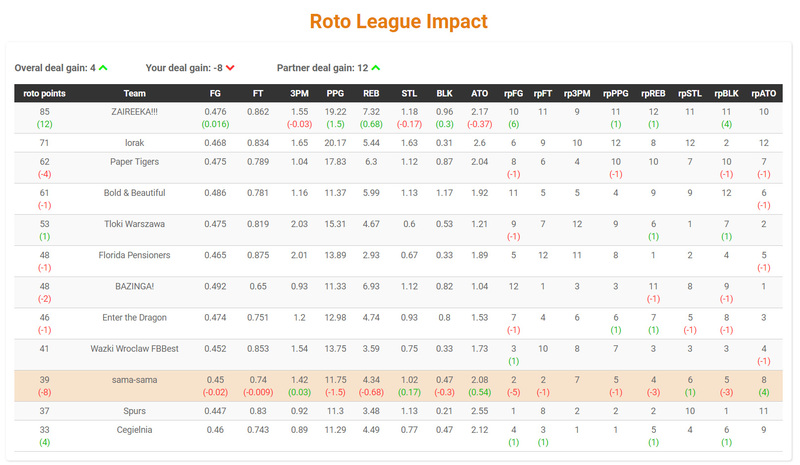 And once you get the FB-Ninja Fantasy Basketball Trade Analyzer to work, you’ll get two blocks of data in return. They sum up both teams taking part in the imagined trade, how the total value profit in each category would look like. And the total overall profit as well. How the league standing looks like now, games played included. Which players are going to produce for each team in the future. Of course, a lot could happen down the road. Players could get injured, could have some ups and downs. Teams could change, hot free agents could emerge, other good deals could get agreed. Yes, fantasy basketball is a very unpredictable animal. But still it’s good to plan in advance. And it’s essential to have a current league outlook. To know where you’re aiming in each category and what to do to increase your real chances to achieve your goals. FB-Ninja tools give you exactly that. While analyzing deal ideas with the Trade Analyzer Pro you not only get detailed information on how the deal would impact competition in every category. Just have a look at the table displayed within Trade Analyzer after you let it do its deep analysis. How does it look like? Is your rebound gain good enough to pull the trigger? How do three pointers look like… and the other stats? Do you get a profit overall? Does the deal complicate things for your closest competitors? What’s very important – if you find a really good deal working for both side, with Trade Analyzer you get precise argumentation for the other manager to convince him (her???) to accept the deal. Yeah! If this happens to you – please let us know in comments and tell the deal details.